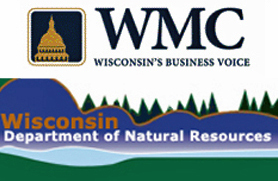 There&apos;s an unlikely partnership in the brewing battle over who&apos;s in charge of the Wisconsin Department of Natural Resources. Big Business is siding with Democrat Governor Jim Doyle when it comes to control over the agency. "We need government at some point to be accountable to the voters, and the way you accomplish that is by having the agencies of government be accountable to the governor, says James Buchen of Wisconsin Manufacturers and Commerce . "Then, if you don&apos;t like the policies you can vote for a different governor." "We&apos;re with the governor on this one," says Buchen. "I think the idea that somehow the public is served by an agency that is not ultimately responsible to the electorate is dangerous." Governor Doyle and Democratic legislators are squaring off, over a bill that would strip Doyle of his power to hire and fire the DNR secretary. Backers of the proposal say science, not politics, should drive environmental policies. "This an agency that has had issues over the years, with people feeling that they were excessively heavy handed in a regulatory sense," says Buchen. "It is a much better situation where a governor can affect policy in an agency."